I like to clean. A lot. Like, obsessively a lot. Is that weird? I get so much satisfaction from cleaning. It actually makes me happy. I’ve always been that way, and ever since our sweet Jade came along, I’ve been cleaning even more. Especially during her crawling stage, when I was going around making sure the carpet was vacuumed and the floors were really clean every. single. day. 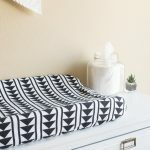 Since I was newly pregnant with Jade, I’ve been trying to ditch any chemicals in my cleaners. And now that she’s a toddler who is toddling herself into everything, it’s even more important that I don’t keep chemicals around for her to “accidentally” find and think she can taste. No thanks. Store-bought cleaners are chock FULL of chemicals. Really bad (and smelly) ones that can possibly cause cancer (source). Most disinfecting wipes contain bleach, which is one of the top 10 hazardous household chemicals (source). AND, some cleaners even contain pesticides. Yikes! I definitely don’t want to “clean” my kitchen counters with pesticides and cancer causing chemicals. Did you also know that bleach can make asthma and any respiratory problems worse (source)? The fumes are harmful to us, but even more so for pregnant women or children. Before I was pregnant, I’d buy the huge Costco pack of the cleaning bleach Wipes. I’d use them for everything and go through them SO fast (and now I shudder thinking about that…). And then one day I was doing some research and found a website that gave these wipes a rating based on their ingredients. The rating they received was a big fat “D.” Now, I’m a teacher, and a “D” is most definitely not a good grade. In fact, it’s a borderline failing grade. Since I much prefer “A’s”, I ditched every single last container of cleaning wipes I had left (You can read more about the “D” grade here). So, instead of nasty, harmful, TOXIC chemicals, I now use much more natural (and delicious smelling) homemade reusable cleaning wipes. Do yourself a favor; ditch your current store-bought cleaning or bleach wipes and sprays and make these instead! Not only do they have NO toxic chemicals whatsoever, they are also reusable and eco-friendly! AND, they’re more cost effective than buying the store bought ones, too. Woohoo! 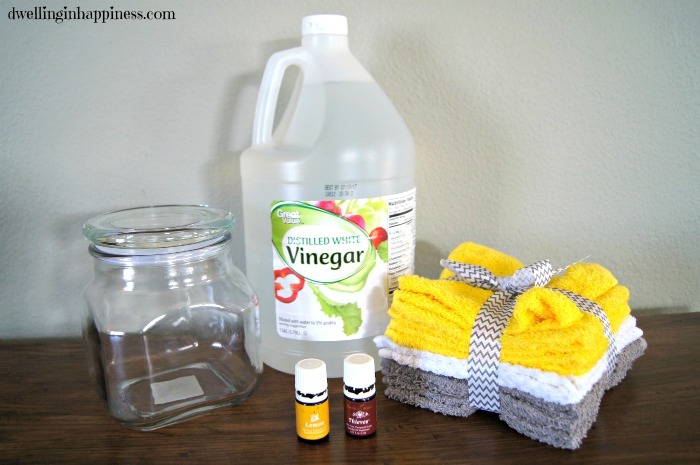 To make your cleaniung wipes, you’ll add 1/2 cup distilled white vinegar to your jar, as well as 3/4 cup of distilled water. 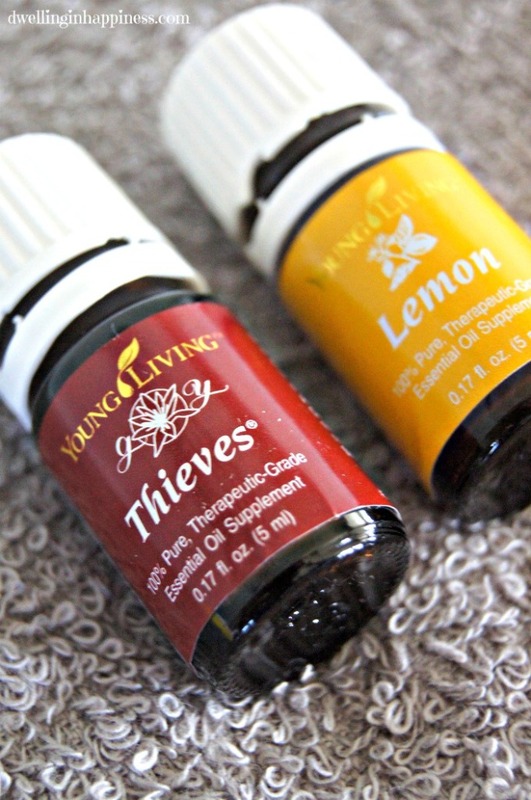 Pour in 12 drops of your thieves essential oil. And about 5 drops of your lemon essential oil. Put the lid on tight and carefully swirl the liquid around to help it mix together. Put in your small hand towels/cut up shirts, and replace the lid tightly. 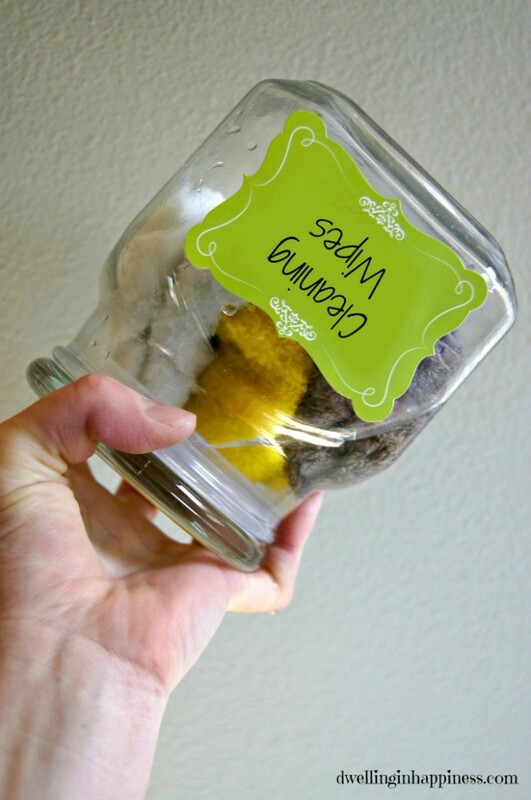 Turn the jar upside down and gently shake to get the “wipes” saturated. To use, just pull out a “wipe,” squeeze/ring out the excess liquid back into the jar, and wipe your dirty surfaces away! 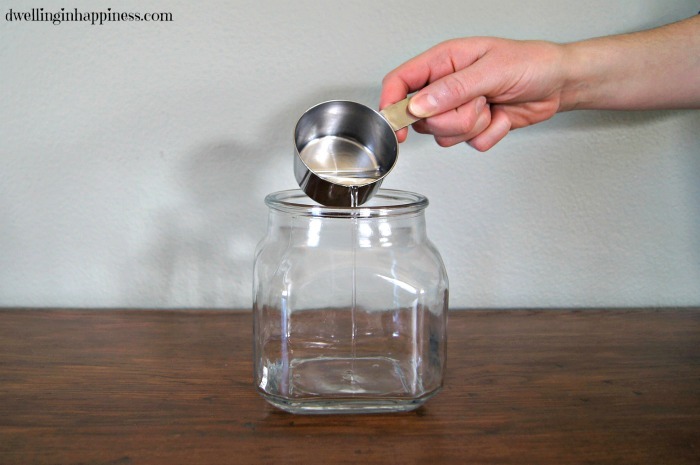 Rinse out with hot water, and place back in the jar to soak up more of the cleaning solution. I wash the towels every few days to make sure they stay clean. 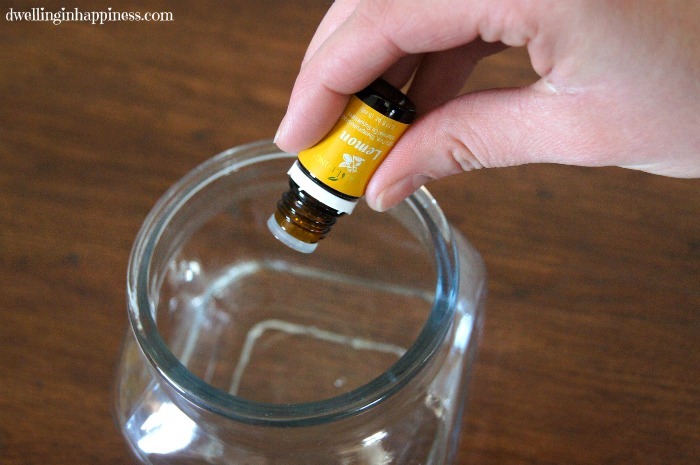 It’s best to store the jar in a cool dark cupboard to preserve the essential oil properties. I keep mine right under our kitchen sink so they’re easily accessible! 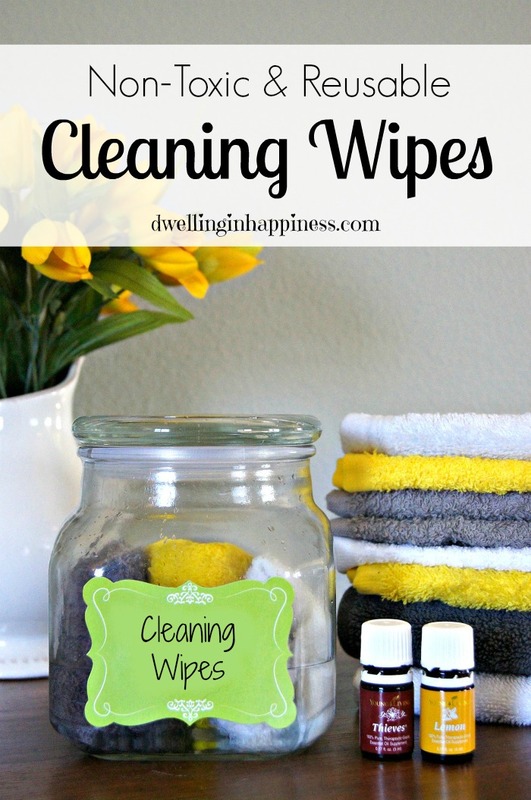 I use these to clean literally everything: kitchen counters, sinks, faucets, microwave, door knobs, bathroom counters, and even the toilets (those wipes I toss right into the dirty laundry to be washed)! Because there’s no harsh chemicals, they can be used on any surface in your home. Total score! You can even toss your sponges like I did and use these wipes instead. Those sponges are a breeding ground for bacteria! TIP: Before going to the grocery store, wring out a wipe and stick it in a baggy. Use the wipe to clean the shopping cart handles before you shop, especially if you have kiddos! Just pop the used wipe back in the baggy and take it home to wash. The store’s shopping cart wipes may be convenient, but they still contain the same harmful chemicals as any other store-bought wipe. You don’t want your baby touching the “sanitized” cart handle, and then putting her fingers in her mouth! Because, kids will be kids, right? Friends, mommas; PLEASE ditch your old cleaning/bleach wipes for good! These homemade cleaning wipes work great, and I feel SO much better about cleaning my house knowing the fumes that my baby is breathing aren’t toxic. Yay! If you’re looking to learn more about essential oils and join our community, click HERE! Great idea! 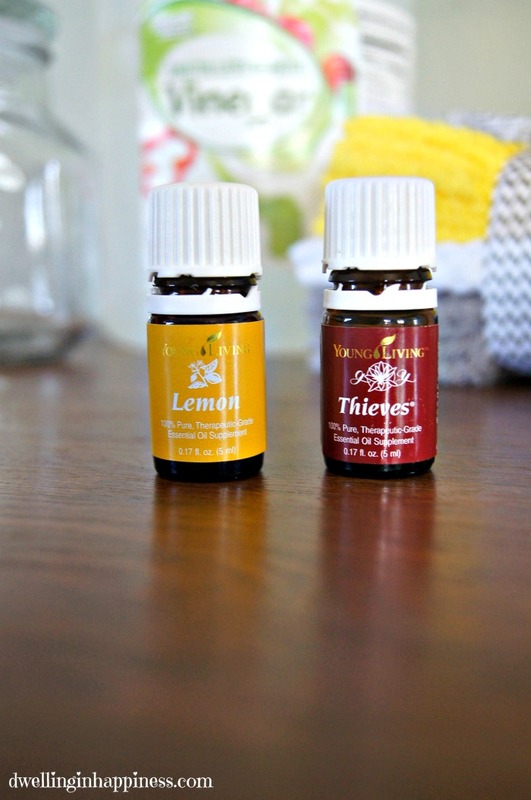 I’ve been making my own household cleaners for about a year now but I’ve never used the thieves/lemon oil combo. I bet it smells fantastic! Definitely going to try it. This is great, Amanda. I think I am going to start an essential oils pinterest folder for stuff like this for when I decide to buy some oils!! Thanks for sharing. Right now I use Mrs. Myers, which is sold at Target. I read on the bottle you could drink whats in it and be ok, NOT that I’d try!!! But, it is a lot less harmful then some of the other cleaners out there. I do keep bleach on hand though when the kids get sick… but, just for those occasions. I am a clean freak, too! Thank you, Carrie! 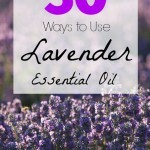 Totally, I’ve been pinning essential oil posts like mad now! 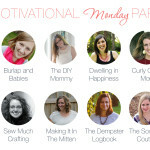 SO many fabulous uses for them! I’ve heard good things about Mrs. Meyers too, but I haven’t used it personally. That’s quite the disclaimer! I’d say the same about these, too. 🙂 Thanks for stopping by, hope you have a fab rest of the week! How long do these last without molding? I have made some with tea tree oil, distilled water, small amount of dish soap, and vinegar. My only problem is I guess I make too large of a batch and I see mold on the cloths after a couple of weeks. Maybe I will try a smaller batch. Thanks for sharing! This is a great idea. I love cleaning with vinegar. This looks like it would smell so nice and fresh after. I love this! I am a bit of a germ-a-phobe, but that’s why my husband and I rarely get sick. 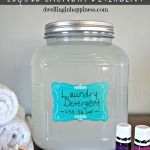 I would love to try this rather than harsh chemicals that are not good for our pets! Thank you, Karen! This is SO much better for your pets, and you, too! And it smells really good. 🙂 Hope the rest of your week goes great! So does the water have to be distilled or can I use boiled water? I use the aquasana water filtration system which is supposed to remove over 98% of the toxins from our tap water also. What do you think? Fantastic! I have never made reusable wipes. I definitely will try to make them. It sounds easy. Thank you for sharing this method. I am fond of all cleaning homemade solutions. Keep posting! Best regards! Hi! Thanks for sharing this! 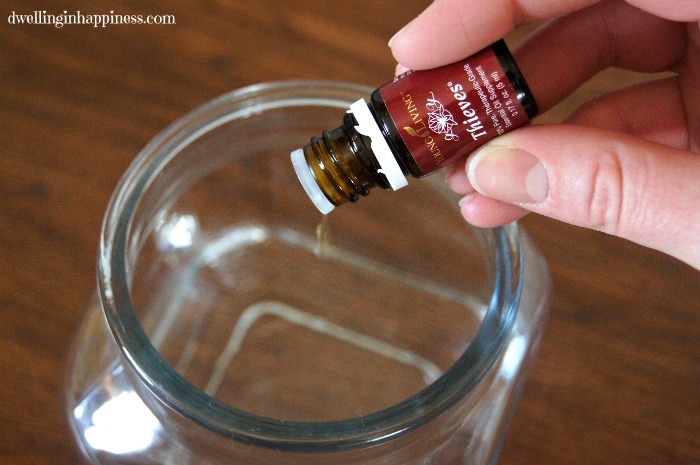 Does the thieves essential oil help with cleaning or is it just for scent? You said that the lemon oil helps with the cleaning but I am considering skipping the thieves or swapping with something else. Thanks! Hi Sarah! Thieves oil totally does help with the cleaning. Since posting this, I’ve actually ditched the lemon in my solution and just use the thieves. It really has some great cleaning properties! Lemon also has great cleaning properties, so you could still do either or both! 🙂 Hope that helps! I use 50/50 well water and white vinegar to clean my deer processing plant. If I add essential oils do I have to rinse it off? This is perfect! I started making my own cleaners after I had my daughter (she’s 6) and putting them in spray bottles, but the spray bottles always let me down. They’d stop working, or leak, or have sort of failure. I started buying natural cleaning products, but they’re so expensive! I’ll be making these this week. I love the wipes, but my husband absolutely hates the smell of vinegar. I mean hates it. Do you think I could substitute vodka for the vinegar. I don’t want to go back to the store bought chemical brand. I am trying to make all my cleaners my self. 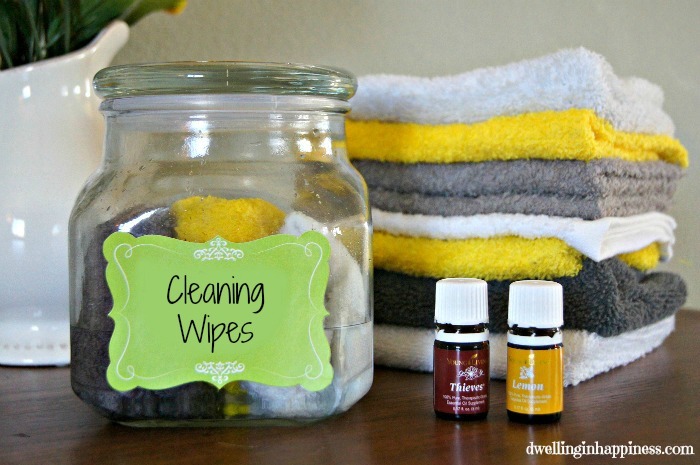 I make my own cleaners as well, and I am definitely going to try a version of this recipe. After researching Thieves, I learned that it is not good for kids under age 10 since it includes eucalyptus. That particular oil can cause issues breathing for littles. Just FYI. 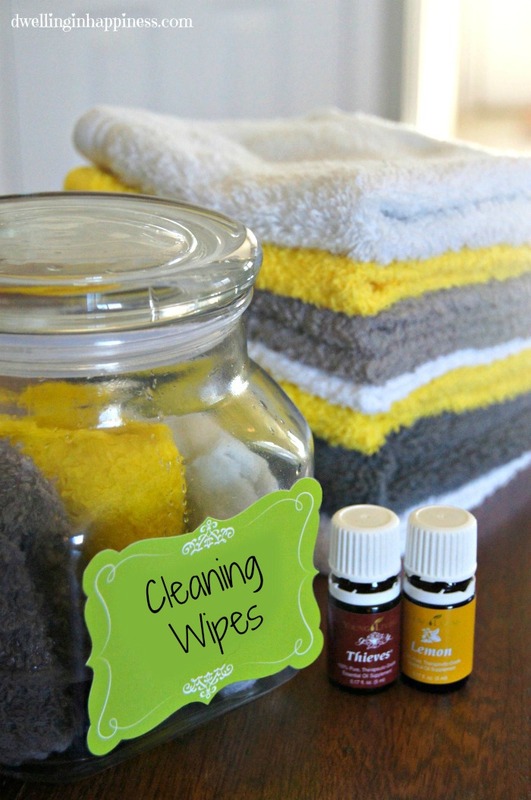 Have you made these with the Thieves ready-made cleaner? Hello! Love this idea! Just wondering I can but the essential oils at? I’ve never bought any. Hey Olivia! So glad you love this idea! My family does too. 🙂 I’ll send you an e-mail with more info on where to get essential oils!